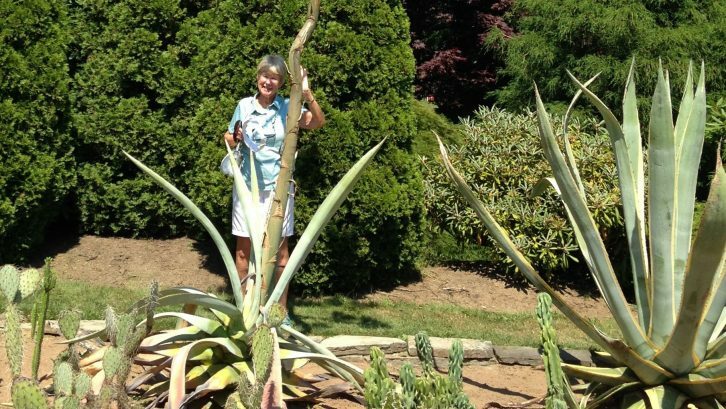 Elise Doane posed with the Halifax agave when it was in bloom in 2018. She believes she may have donated it 30 years ago. Submitted by Elise Doane. 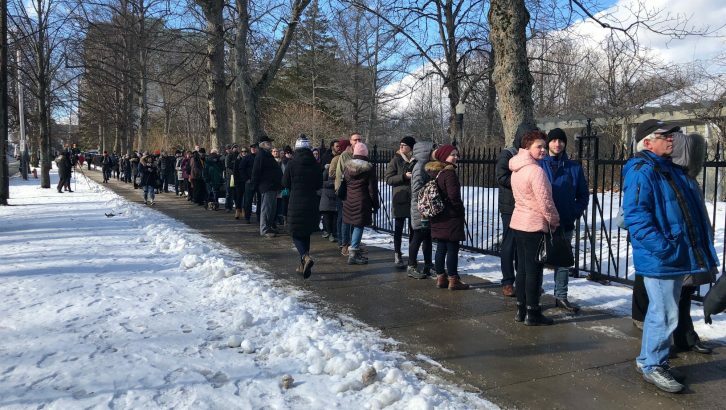 Hundreds of people lined up outside the Public Gardens Thursday hoping to score one of the 158 seeds from Halifax’s famous Agave Maria. Nicknamed Agave Maria, the plant moved to the Public Gardens last April when its meters-long asparagus-like stalk became too tall for the municipality’s greenhouse. The agave became somewhat of a celebrity around this time as well. Thought to have been dying, the plant cheated death and achieved full bloom in the summer. Some people, like Dwayne Sawchyn, waited in line for over an hour Thursday, anxious to get their seeds and head for warmer pastures. “I never line up for anything, but hey this would definitely be a plant with a story,” he said. Agave plants only flower once over their lifetime, signifying the end of their lives, but one woman near the back of the line was thinking about the beginning of the plant’s life. Elise Doane believes Agave Maria may have been an agave she donated to the gardens more than 30 years ago. “There’s no way to know for sure, but it would be a really fun way for it to come full circle,” she said. On a trip to the Virgin Islands, Doane brought home her agave, but it got too big to care for. “I had to get rid of it. The park was willing to take it and I think this may actually be it,” she said. She called the Public Gardens several times about the plant, but they didn’t have a record of who donated it. Still, she was looking forward to possibly getting a seed. “It would be so, so cool to be able to get one,” she said. The seeds went quickly and were handed out within six minutes. More than 50 people, including Doane, didn’t get a seed. Well, I’m extremely happy to see that my Son Dwayne Sawchyn was a Happy One to get a seed. He will treasure and nurture it with great care and love. Thank you all for the happy growing season to come. Too bad since the lineup for the seeds was long the person who was distributing them gave out two ore three seeds so all went home with some. Side the plant grows really big that’s all the need. Where does one hear this news the seeds would be distributed?